I love sidewalks, but Atlanta is not much of a sidewalk town. Not that certain neighborhoods in the city don't have them; many do. But mine doesn't. Not even close. But if I did have a sidewalk, I'd want it to look like this. The garden pictured above is in the eastern part of Atlanta, in an area that had once fallen on hard times, but has made a huge comeback. All through good times and bad, it has had sidewalks. Brooks Garcia, a popular and very experienced garden designer, moved into this house (seen in the upper right hand corner) several years ago. He immediately started planting in every available space. The scene above, which includes the climbing antique rose 'Silver Moon' and a mass of yellow Phlomis fruticosa, is actually on the street that runs down the side of the house. Brooks constructed an entrance to the back garden. 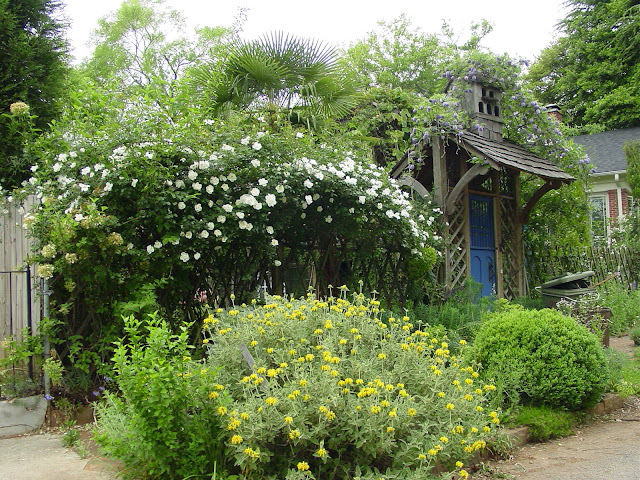 Clambering on top of the rustic structure is the American wisteria, 'Amethyst Falls'. It has smaller blooms, flowers at the end of April, well after its destructive Chinese cousin. If you walk up the sidewalk past the Herbie (that's what we call the green garbage containers in Atlanta) and look to the left, you'll see more roses planted in borders alongside the house. Go around to the front, and the sidewalk there is overflowing with flowers. In May, the large chartreuse heads of Euphorbia characias ssp. wulfenii hang over the pavement. On a fence and scrambling up a tree are more roses, namely the lemon yellow David Austin rose 'The Pilgrim'. Needless to say, passersby often leave notes of appreciation for Brooks. I've known Brooks for years. 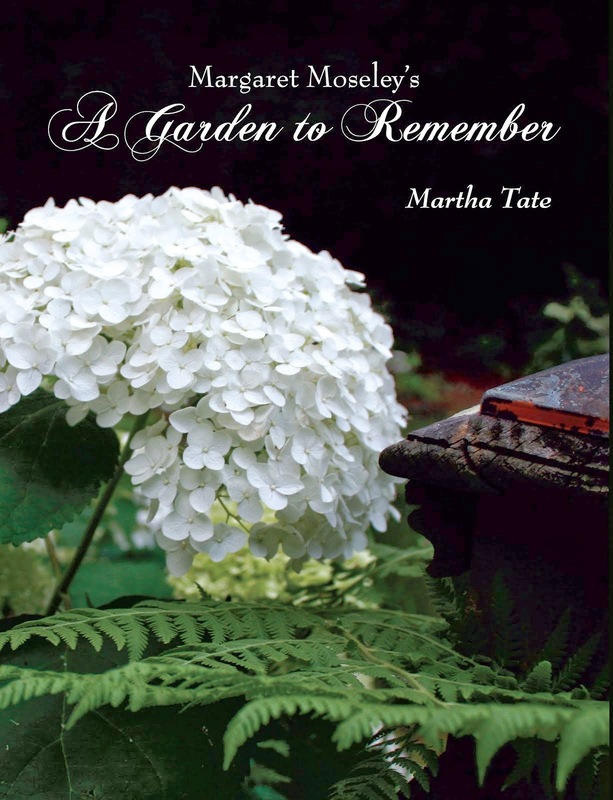 His first garden was in back of his mother's house near Chastain Park. It was magical and chock full of interesting plants and ideas for economical structures that looked great. One of my favorite magazine covers ever shows Brooks in this garden (the magazine was Atlanta Homes & Lifestyles). Next, he lived in an apartment building in Buckhead, and with the owner's permission, he transformed the courtyard into a flower and vegetable garden, complete with tall topiary birds made of privet and patterned borders of parsley and white lily-flowering tulips. It was charming. Brooks has designed many wonderful gardens for clients and has even worked at the Chelsea Flower Show in one of their display gardens. His designs were always a hit at the Southeastern Flower Show, as well. I like everything he's ever done, but I am especially fond of his sidewalk plantings because they bring joy to so many people. Plus, I can drive by and see the beauty anytime I'm in the area. O Happy Day! A Gardener's Diary is back!